This was the third installment in the Moroni Traveler series and so far I have enjoyed them all. 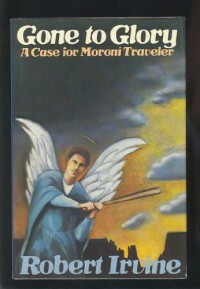 In this one, Moroni is hired to help clear a former semi-pro baseball player of his sister's murder. Moroni is not able to be paid his usual fee for this case, but takes it for old-times sake as he remembers watching the baseball games of his youth. The story flows as a typical PI story set in the 80's and early 90's, where the PI doesn't have access to the internet and cell phones and has to use old fashioned methods to track down people and information. In that regard it is similar to the work of Sue Grafton and I seem to really enjoy this style. Irvine is a good writer, the book is easy to read and the twists and turns keep coming so it's hard to get to the bottom of the case before Moroni does. I also enjoy the Salt Lake setting. My biggest turn-offs with this book specifically are the baseball references and flashbacks. At one point some type of baseball play is described over multiple pages. I have no interest in baseball, so I basically skimmed that section. The previous books are not like that. This series also sometimes can get convoluted with regard to the Mormon church and things that the average reader might not be familiar with, however, I still highly recommend this series if you can get your hands on it. So far I've been lucky enough to find the them all through my local library system.